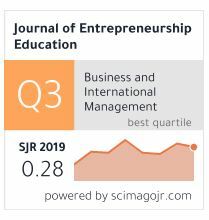 The Journal of Entrepreneurship Education (JEE) is an open access academic and professional journal affiliated to the Allied Business Academy. JEE aims to cater to the broader needs of the business schools that focus on the entrepreneurial training and development as an academic course. Apart from practicing entrepreneurs, trade, commerce and industrial sectors, the journal considers researchers and students as their primary target groups. With an acceptance rate of 30%, JEE follows double blind peer reviewing policy to maintain the publication standards. JEE encourages theoretical and empirical works in Entrepreneurship, Entrepreneurship (International), Entrepreneurship Education and training for publication. More information on the types of manuscripts published and the categories of research accepted are displayed in the Journal Matrix section of this website. Sponsored by the Academy of Entrepreneurship, JEE explores a broad spectrum of topics in this field, including but not limited to global entrepreneurship, business intelligence, entrepreneurial competitive intelligence, entrepreneurial profile, entrepreneurial intention, entrepreneurial career, entrepreneurial orientation-performance relation, academic entrepreneurship, intensive business services, international opportunity, internationalization strategy and entrepreneurial characteristics. Authors who would like to discuss the potential interest in a manuscript may contact Editorial staff.